Natchitoches Multi-Jurisdictional Drug Task Force Agents assist Northwestern State University Police with arrest of student on campus which led to narcotics charges. According to a Task Force official, on May 3, Jeffrey Driskell, w/m, 40, was taken into custody after NSU police received a complaint of a student disturbing the peace at Morrison Hall. Due to Driskell’s actions and demeanor, NSU officers realized the suspect was under the influence of an illegal substance. 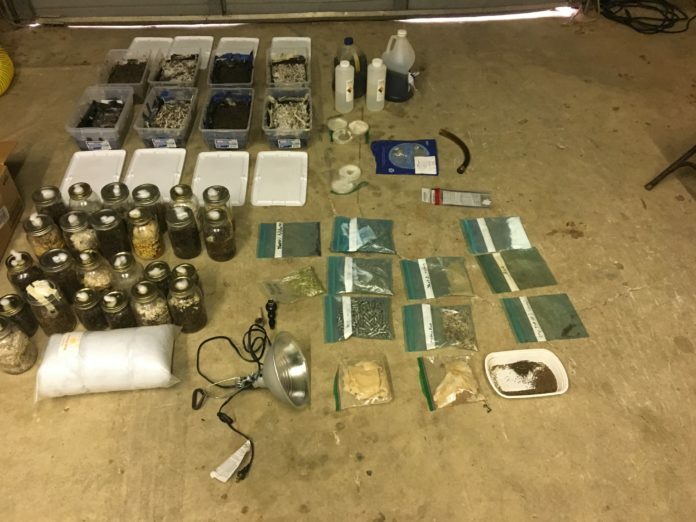 NSU police contacted the Natchitoches Multi-Jurisdictional Drug Task Force for assistance and after a short investigation and interview with the suspect, NMJDTF agents obtained a search warrant for the student’s residence located on Behan Street in the city of Natchitoches. NMJDTF agents along with NSU police executed the search warrant and located 33 active Psilocybin Mushroom grows, approximately 2 gallons of suspected Psilocybin tea, approximately 1,200 clear capsules containing suspected Psilocybin and drug paraphernalia used to manufacture and package illegal narcotics. Psilocybin effects are similar to those of other hallucinogens, such as mescaline from peyote or LSD. The psychological reaction to psilocybin use includes visual and auditory hallucinations and an inability to discern fantasy from reality. Panic reactions and psychosis also may occur, particularly if large doses of psilocybin are ingested. Next articleHappy Pet Appreciation Week!